Evander Holyfield, the former boxer who had part of his ear bit off by Mike Tyson, isÂ about to have his driver’s license suspended after not paying more than $300k in child support payments. Holyfield was originally ordered by the GA Dept. 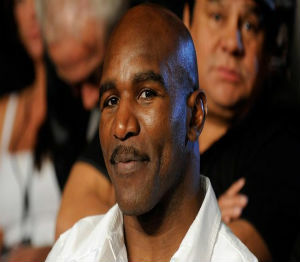 of Human Services to pay over $500K in back child support for his daughter Imani Holyfield.Â But Evander hasn’t complied. Holyfield had a payment plan set up, paying $2,950 per month but according to court documents, he’s missed several payments and still owes $327,858.36. A hearing has been set for August.